China's parliament has endorsed Xi Jinping for a second term and appointed Wang Qishan as his vice-president. 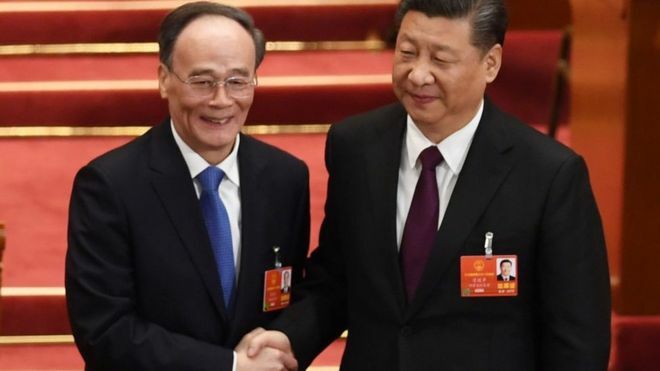 The ballot at the National People's Congress unanimously approved Mr Xi while Mr Wang received 2,969 votes in favour and only one against, reports BBC. Wang Qishan was previously in charge of corruption investigations in China. He is a longstanding ally of President Xi and his elevation is being seen as a further consolidation of the Chinese leader's power. The recent abolition of term limits for the Chinese presidency extends to the vice-presidency, giving the position greater significance than before. China's constitution allows the vice-president to "assist" in his superior's work and to carry out presidential duties on his behalf - meaning Wang Qishan, possibly in his role for life, could be far more than the figurehead his predecessors were.